Next Question: Why isn’t my mail carrier driving a postal truck? If you aren't from a rural area, it might be jarring to see a mail carrier in their personal vehicle. 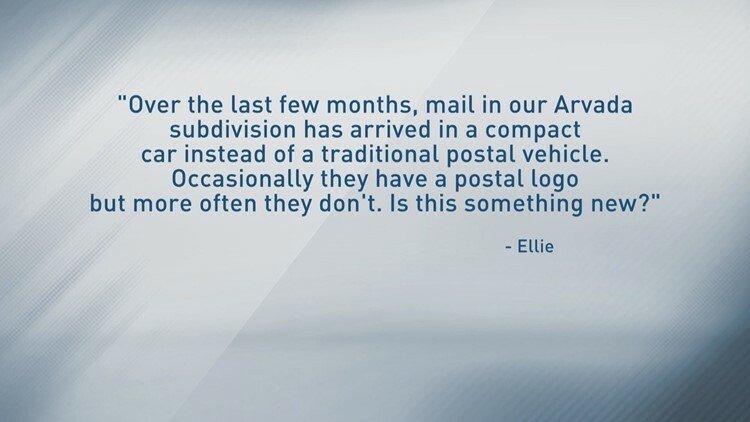 "Over the past few months, mail in our Arvada subdivision has arrived in a compact car rather than a traditional postal vehicle. Occasionally they have a postal logo but more often, they don't. Is this something new?" So here’s the deal: in rural areas, it’s not uncommon to see mail carriers use their personal vehicles. But, in cities and suburbs, you’re more used to seeing a mail truck. Now that some rural areas near Denver are becoming more suburban, you might see mail carriers in their personal cars in more populated areas. If you’re ever curious if a carrier is legit, remember that they’re required to carry Postal Service IDs at all times. The postal service is also looking at a completely new fleet of postal vehicles nationwide in the next few years.